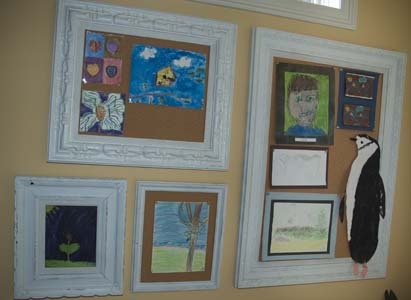 Juneberry Lane: Tutorial Tuesday: Gorgeous Displays of Your Children's Artwork . 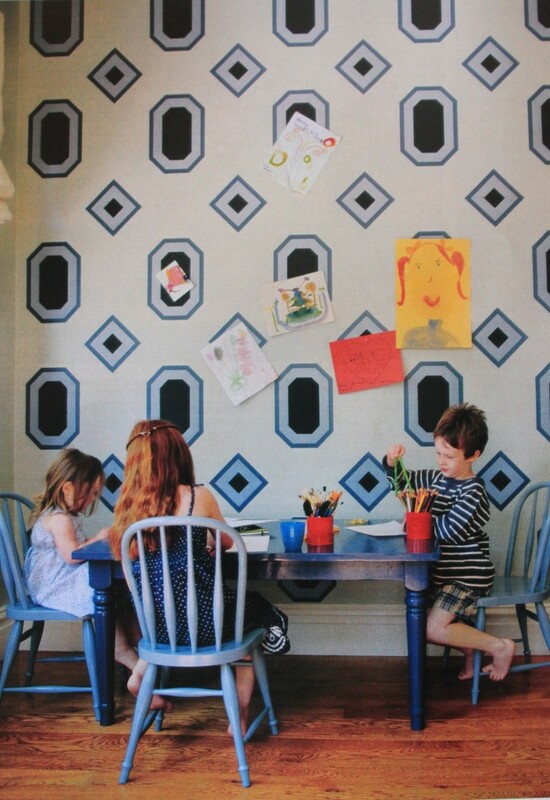 . .
Tutorial Tuesday: Gorgeous Displays of Your Children's Artwork . . . So although my own little sweetie is much too young for me to be making room to hang up his artwork, I am so looking forward to the day when I can dress up my walls with his adorable drawings. I just love the idea of framing his pictures & making him feel so special when he sees his hard work all fancied up on the wall. 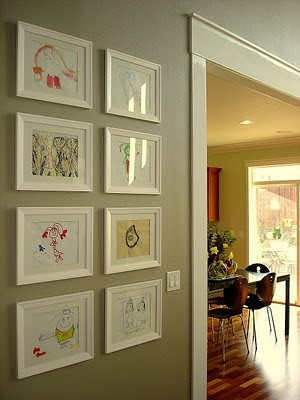 Here are some fantastic ideas and a few easy tutorials on how to display the masterpieces of your own little munchkin . . .
And the rest is pretty self-explanatory . . .
Have a bit more modern style? 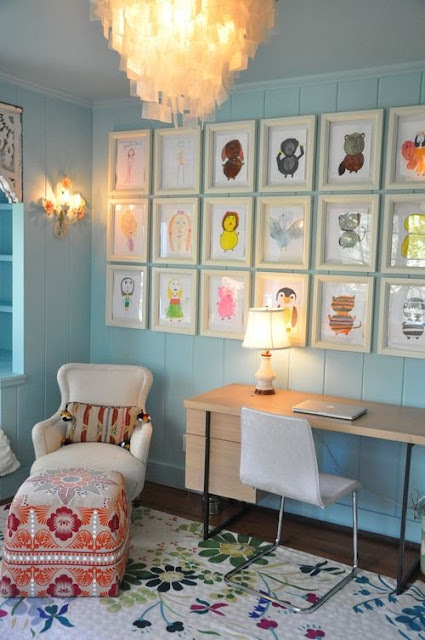 Why not run industrial style cable along the wall and clip the lovely painting to that. 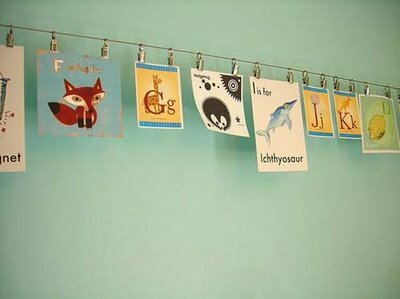 And when the holidays arrive this can double as an excellent way to display Christmas cards or Birthday Cards as well, so no more counter clutter...hooray! 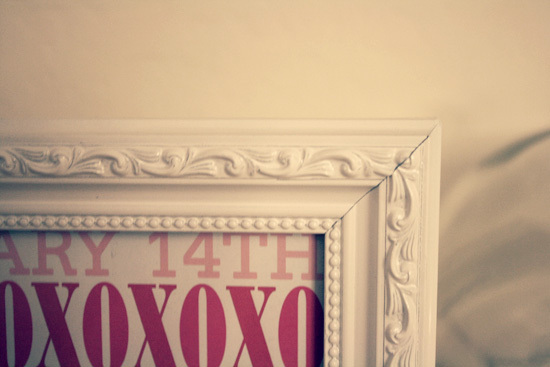 And my absolute favorite. I just love the fact that the wall below is painted to look like vintage wallpaper and that inside each of those wonderful little shapes is Magnetic Chalkboard paint (found at your local hardware store). 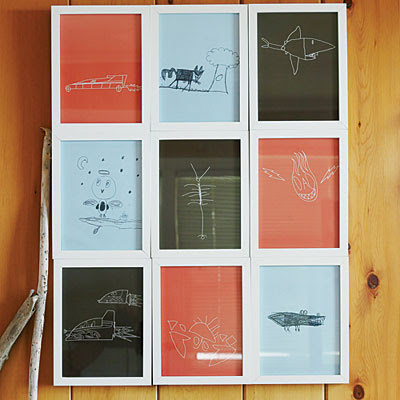 All you need to do is slap a little magnet on the back of each drawing and you have the perfect way to proudly show off your child's most adorable masterpieces. Now all you have to do is convince your little darling to get painting...or in my case wait around for a bit until he can actually hold a crayon. Sigh . . .